Cycle Vermont 6-Day - NEW! Champlain Valley, Middlebury & The Adirondacks - NEW! POMG – Peace of mind guaranteed. Thousands of Connecticut residents still recognize the longtime marketing pitch of colorful Hartford jeweler Bill Savitt, even a quarter-century after his Savitt Jewelers closed on Asylum Street. Savitt himself died in 1995 at age 94. 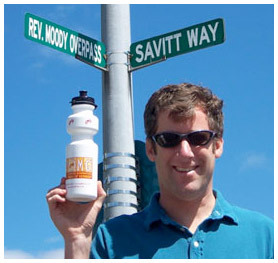 But POMG lives on both in spirit and as a marketing message in a latter-day enterprise, POMG Bike Tours of Vermont, founded and owned by Savitt's grandson, Richard L. First of Richmond, Vt.
POMG Bike Tours offers more than 35 multi-day guided bicycle tours throughout Vermont, with varying levels of difficulty. Customers dine and lodge at Vermont country inns at night. First grew up in suburban Boston but often visited his grandfather as a child and attended Loomis Chaffee School in Windsor during the 1980s, frequently stopping by the jewelry shop while a student. 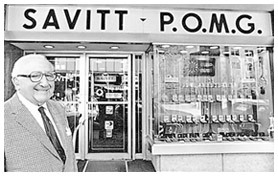 Savitt was known for his good-will gestures in the community and his marketing prowess, best exemplified by the POMG theme, which he promoted in neon, on shopping bags and in print and broadcast advertising. "He left a lasting legacy, in my mind," First said. "And through this business, to a degree, we have kept his spirit alive, his spirit of the golden rule of service, his Peace of Mind Guaranteed. First and foremost for my grandfather was customer service, and not just lip service. That is what he would say - meaningful, memorable service." First and his wife, Jenny, have a 3-year old daughter, Estelle, and a son born in April who's first name is Savitt. First isn't selling watches or diamonds, of course, but an experience in the outdoors. Either way, customer service is customer service, First said. "We are going to follow through and make good on everything we say or write. If anybody has a problem, we are going to take care of it, and take care of it quickly. We are going to do everything we can to make sure our customers have an excellent experience." First founded POMG Tours in 1995, starting with seven bicycle camping tours. Since then, the number of tours and routes has greatly expanded, and customers now stay at inns or bed-and-breakfast lodges. First employs 12 tour leaders who average eight years each in the industry. All are trained in bike repair, first aid and CPR. Tour prices are based on per-person, double-occupancy. A weekend 200-mile tour along Route 100 from the Canadian border to the Massachusetts border costs $395, for example, while a fall six-day, five-night Lake Champlain tour is $1,345. All tours except the Route 100 tour are rated easy to moderate, with more challenging options available for advanced cyclists. William Myron "Bill" Savitt gives one of his last and famous winks outside his Asylum Street store.